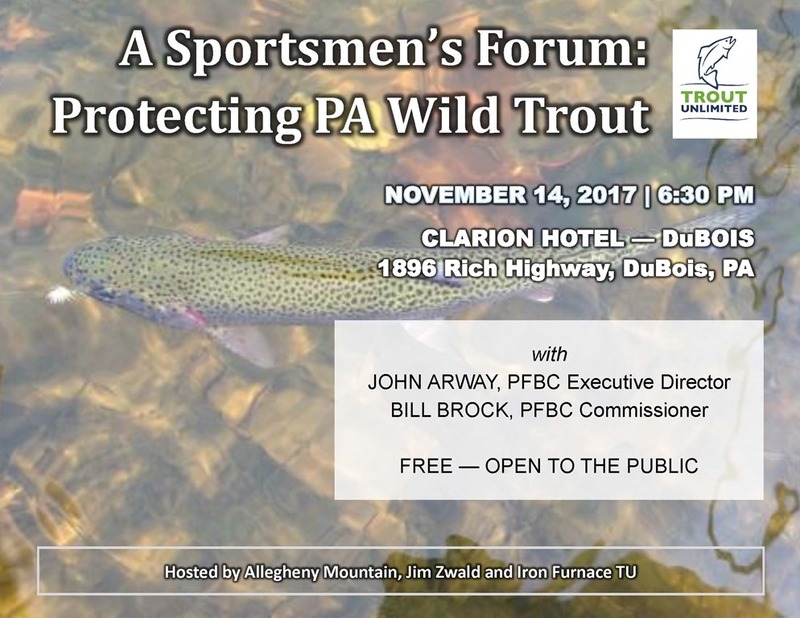 The Allegheny Mountain Chapter of Trout Unlimited will be hosting an evening of learning to Euro nymph fish. The program will start at 7 pm on November 20, 2018 at the Penn State DuBois Campus in the Conference Room in the Smeal building. Codey Schlemmer and Rich Ferrara will demonstrate the technique and equipment to make you a better fisherperson. This event is free and open to the public. 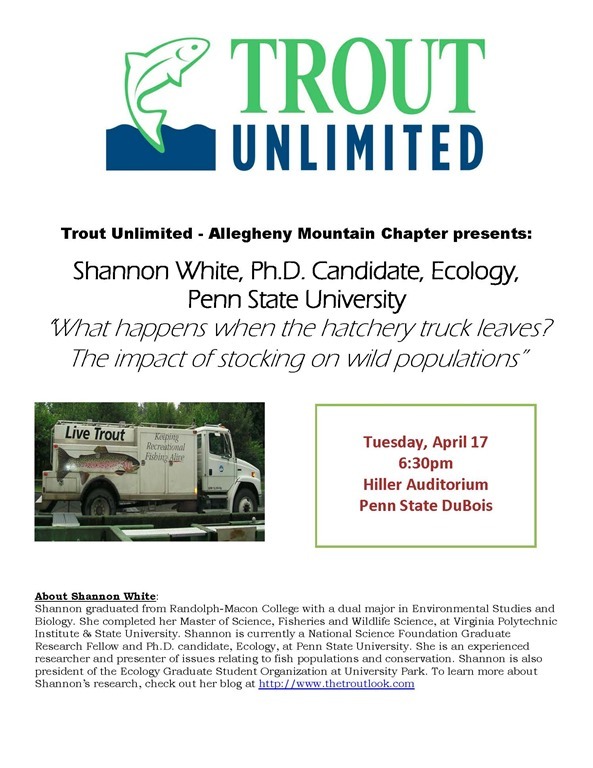 Please join us for Shannon White’s presentation on Tuesday April 17, 2018 at 6:30 pm on the impact of stocking on wild trout populations. Due to the interest in this topic, this program will be held at the Hiller Auditorium at Penn State DuBois. The public is invited to attend and there is no charge. You can learn more about Shannon and her research at www.thetroutlook.com. The Allegheny Mountain Chapter will be hosting a fly tying roundtable at their monthly meeting on January 16th at 7PM. The location will be the conference room at the Mary Smeal Building at the DuBois Campus of Penn State. Many tiers will be showcasing their talent including some pike and musky flies. This is a great opportunity to come out and ask questions or learn a new technique. The public is invited to attend and there is no charge. • Approved sponsoring to send four youth from our region to the Pennsylvania Rivers Conservation and Fly Fishing Youth Camp at the Allenberry Resort Inn in Boiling Springs, PA.
• Approved a one-time donation of $500 to the Galeton Development Corporation for the Galeton Dam and Lake Feasibility Study. The Galeton Dam is a significant fish passage barrier for Pine Creek, and this study will address providing fish passage and other ecological issues. The next AMCTU board meeting is 7 pm on August 1, 2017 at the DuBois Nursing Home. All membership is welcomed to attend board meetings.